Many a tour guide has made a significant amount of money holding Sherlock Holmes or Dickens character tours in London looking at the real locations of their fictional counterparts. Some would consider this foolish. Why look at place that these characters never walked? They weren’t real people after all. That’s true, but visiting these places can also offer a look into the mind of the author. The writer most likely walked these streets and researched these locations. Writing is all about closing down possibilities and making choices. Why did they choose this particular building or street to set that climatic scene? Why this neighborhood versus one on the other side of the city? If you open your eyes and look closely, you may see why. If you’ve read John le Carré’s Smiley novels, I’m sure in your mind you can picture the Circus, Smiley’s flat and many of the other locations that appear in the books. However, they aren’t just made out of whole cloth. If you’re persistent many of the places can be easily found and several people have already done the heavy lifting of pinpointing the exact locations. I’ll highlight some of the posts that discuss the real life Smiley locations as well as a rarity I came upon. With the new Smiley book, A Legacy of Spies, about to be released and le Carré himself giving a rare appearance in London, there is no better time for a tour. Following the release of The Secret Pilgrim, Paula Span, at the time with The Washington Post, wrote the gold standard for Smiley searchers. Her article is a must read she makes you feel as if you are right there with her as she tracks down the various spots. She even finagled her way into Smiley’s fictional home and got an interview with le Carré himself. Unfortunately the online version doesn’t show the photos that accompanied the original article but her writing is so good it doesn’t matter. She has said it was one of the most fun articles for her to write. This is a neat article in the The Daily Mail on 9 Bywater Street. It was written in 2013 as the longtime resident was preparing to sell the home and includes a photo of a note le Carré wrote explaining why he chose that building. One of the best online resources is a post by author Stan Trybulski. He directs you to the can’t miss locations like Smiley ‘s home and the Circus but also some more obscure locations such as Smiley’s club and Heywood Hill the bookstore he frequented. The comments on the post also offer a additional information on some of the BBC adaption locations. Trybulski also gave Geoffrey Household’s Rogue Male a similar treatment with this post tracing his hero’s path through Dorset. Finally, on a recent trip to Washington D.C. I stopped in the map room of the Library of Congress located in a hidden basement. 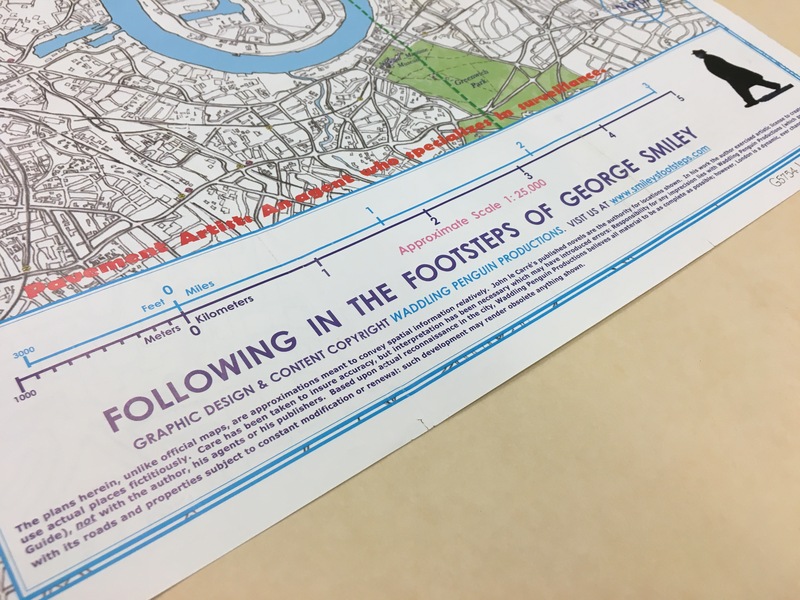 There I found an obscure map that had been released around 2001 by a company called Waddling Penguin Productions titled Following in the Footsteps of George Smiley. The website for the company is now defunct (a version can be seen on the Internet Archive) but they put together a wonderful map of the various Smiley locations. I don’t know if whoever made them still has copies, but I hope they are standing out in front of Festival Hall come September 7th. I’m sure they’d make a killing. I’ve created this bare bones google map of some of the big Smiley locations. I’m hoping to add some additional details over time and hopefully some pictures after this September. If you’re in London and a superfan, I’m sure it’s worth your time to check out a few. I know I will be.